This week at Pacific was busy with learning. I had the opportunity to experience, view and share poetry in grade one, building and tinkering in grade 4/5, inventing and problem solving in 5/6, imaginative play in K, learning evidence displays in 3/4, work by our leadership team, checking out life in our Sea-Aquarium, and teaching grade 3. I was fortunate to have the chance to spend an hour teaching grade one this week. We spent time looking at our word of the day. Students read a poem together and then spent time completing their own. The highlight for me was students sharing their favourite poem with me! 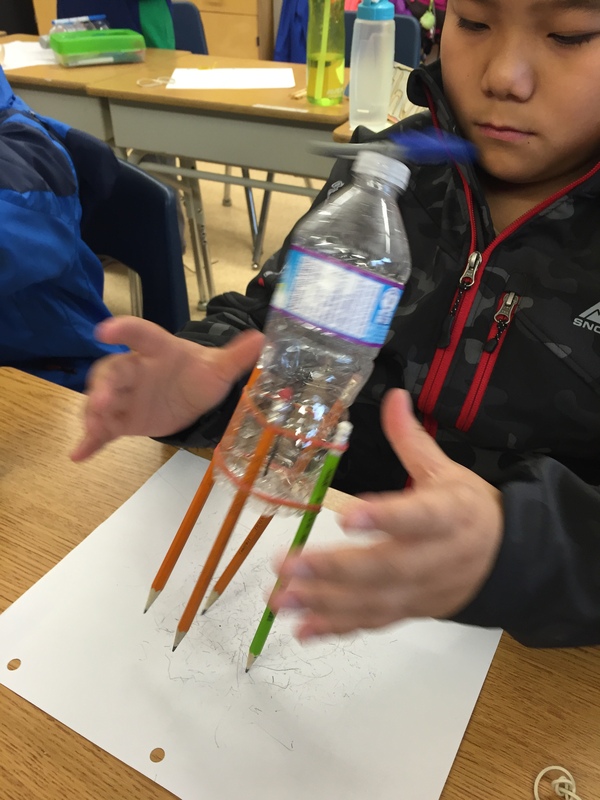 In grade 4/5 students were busy building, tinkering and learning through hands-on activities. A group of boys were experimenting with different designs of MarbleWorks in the hall, and a group of girls playing a word game on an a device called an Osmo. 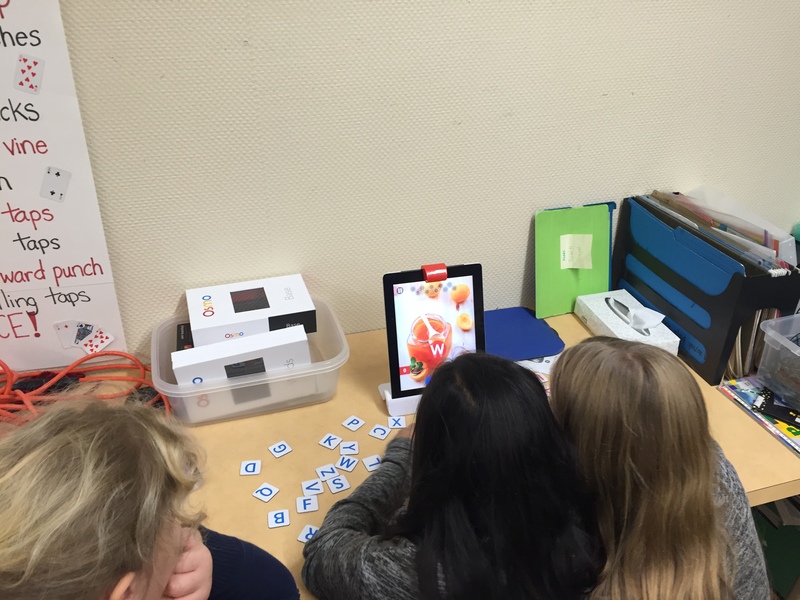 An Osmo, turns an iPad into an interactive tool for learning. Word creation, number work are all possibilities in a fun way! 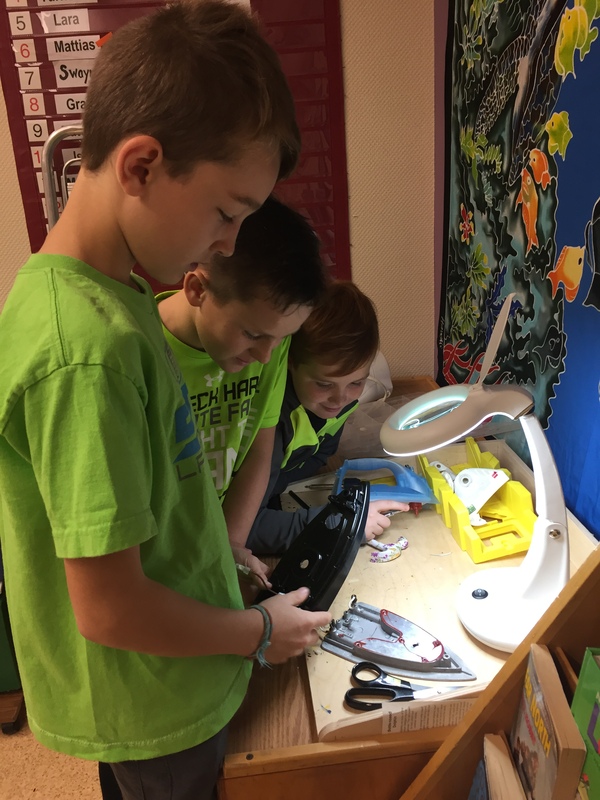 At the tinker station, a group of boys were dismantling an iron to see how it works. I asked if they would put it back together, and they responded with,”no way!” Perhaps they will tackle that next week! 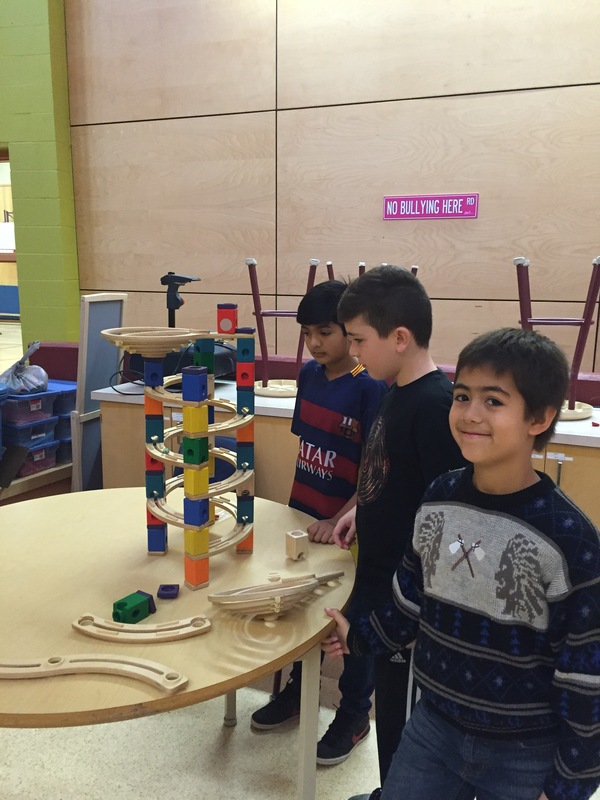 Adam, Nic and Armaan with the beginnings of their marble structure. This group is playing a word game with the Osmo. The game involves both letter and picture clues. The students have to try to create the word on the table using letter tiles, before the other. Ashton, Turner and Jordan are busy taking apart an iron at the tinker station. In grade 5/6 students were working on their weekly problem solving, hands-on challenge. 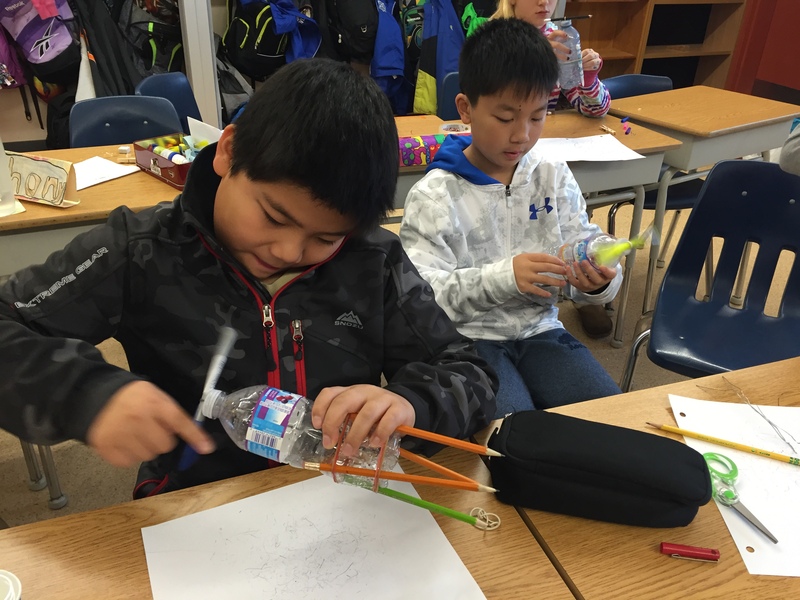 This week, students were given a variety of supplies: a water bottle, elastic, and some wire. Their challenge was to create a machine that could draw by itself. Many were successful. Steven and Daniel working on their drawing machines. Daniel said the hardest part was connecting the elastic that drives the machine. Steven came up with his own unique design! I’m always surprised by the level of creativity displayed by our newest students. 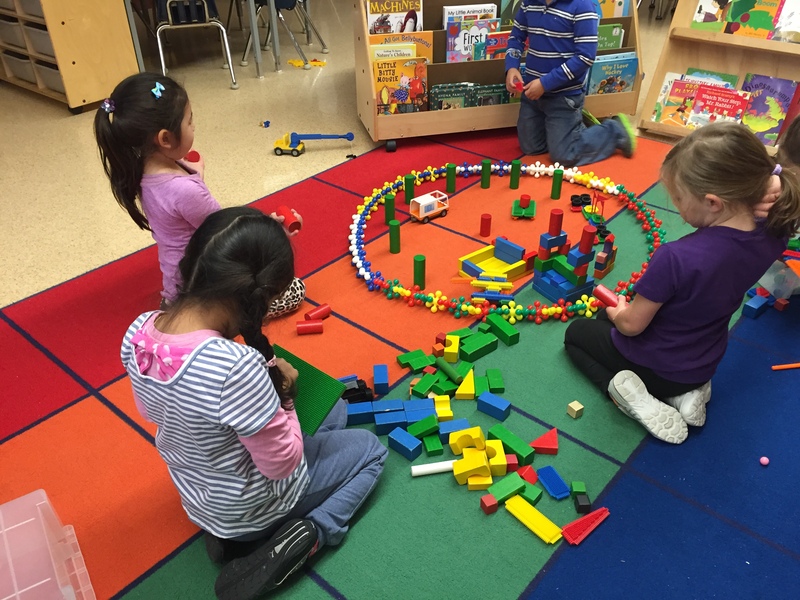 I have visited our Kindergarten classes on a few occasions during center time and the imaginative creations are a sight to see. On this visit, a group of boys were busy creating spaceships, boats and cars using all sorts of building materials. The group below had created an incredible castle and village. 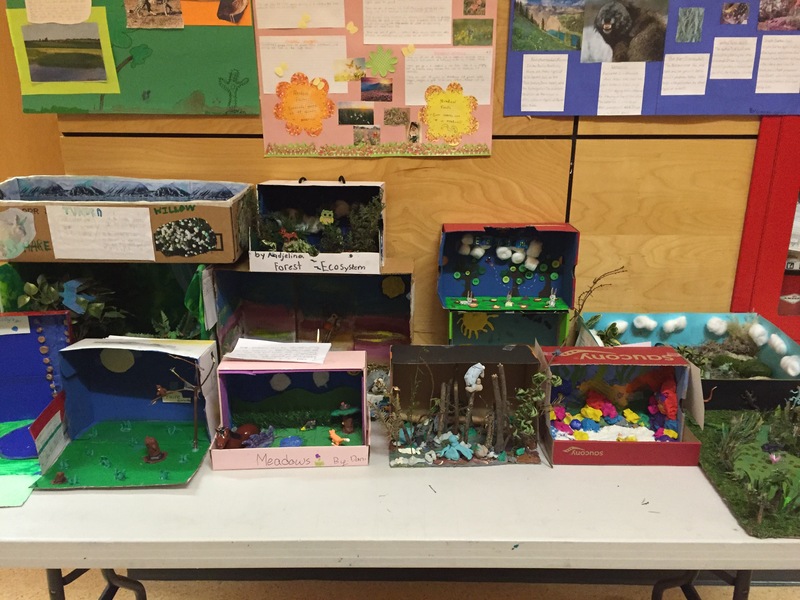 Walking the halls, I came across the finished projects and posters of some of our grade 3 students. 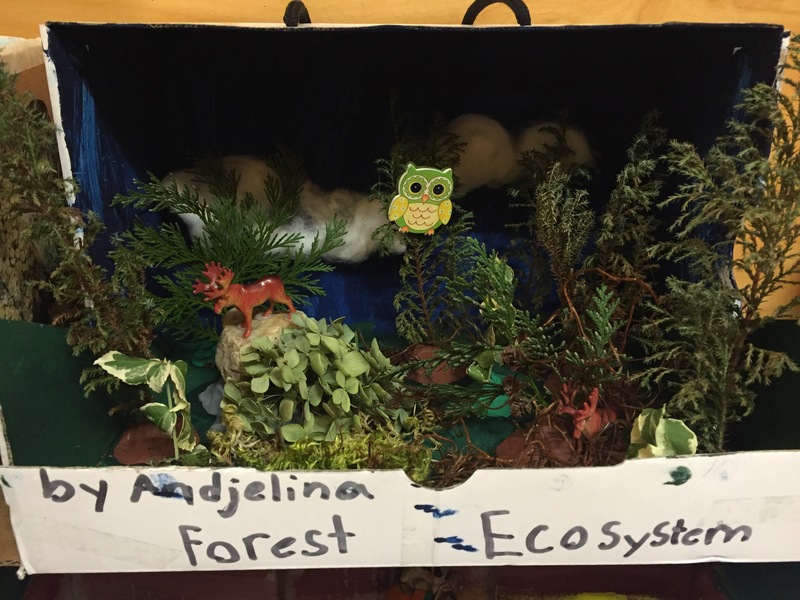 They have been learning about different ecosystems and had the opportunity to create diaramas of their work. 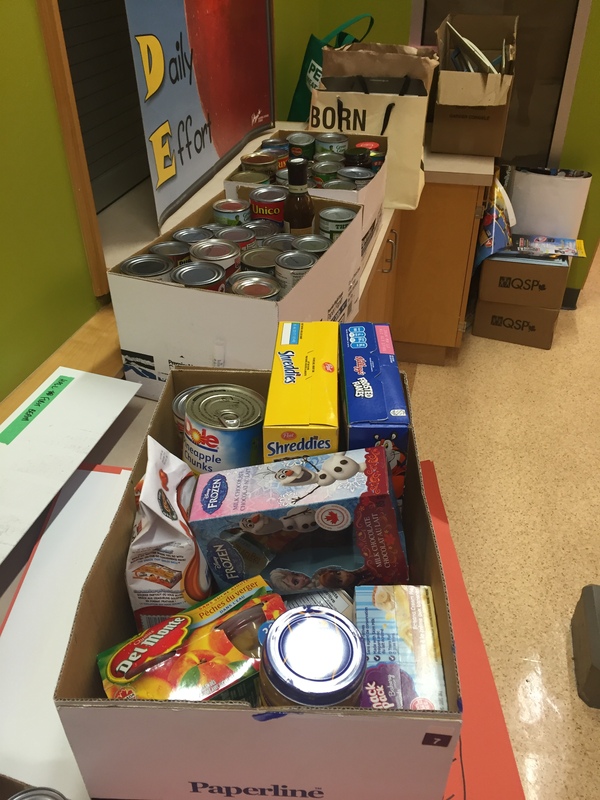 Our leadership team has been very busy collecting food donations for the Surrey Food Bank. They called this drive, We Scare Hunger! Great work students! Last week, our Sea-Aquarium received an entire new population of critters. It has been very exciting to experience first-hand the relationships between prey and predator. Students crowded the tank as a hermet crab found a meal in a sea snail and watched our resident squat lobster reach for a meal of shrimp just added to the tank. My favourite part of this week was spending a morning teaching our grade 3 students. I arranged for Mrs. Darby and Mrs. McIntyre to visit a neighbouring school to experience a Literacy program they have introduced in their own classrooms. It is called the Daily 5. The Daily 5 is a framework for structuring literacy time so students develop lifelong habits of reading, writing and working independently. 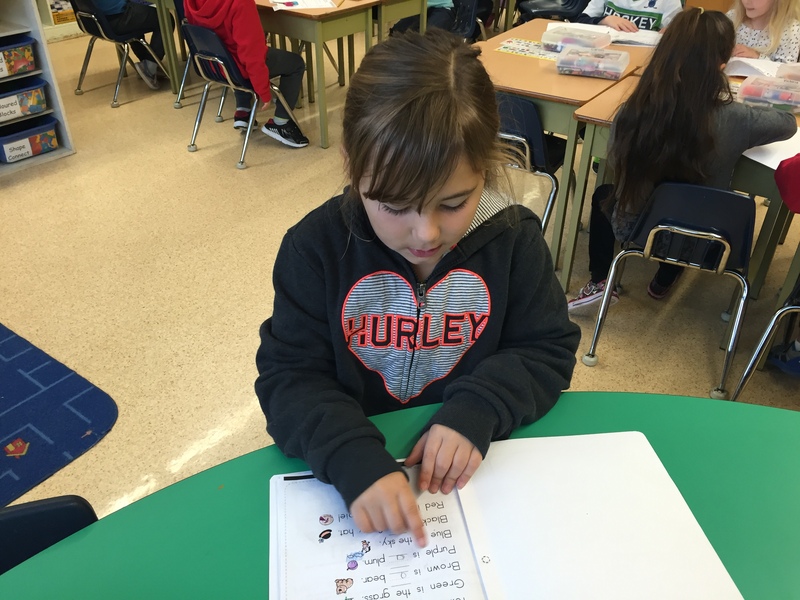 Students select from five authentic reading and writing choices, working independently toward personalized goals, while the teacher meets individual needs through whole-group and small-group instruction, as well as one-on-one conferring. 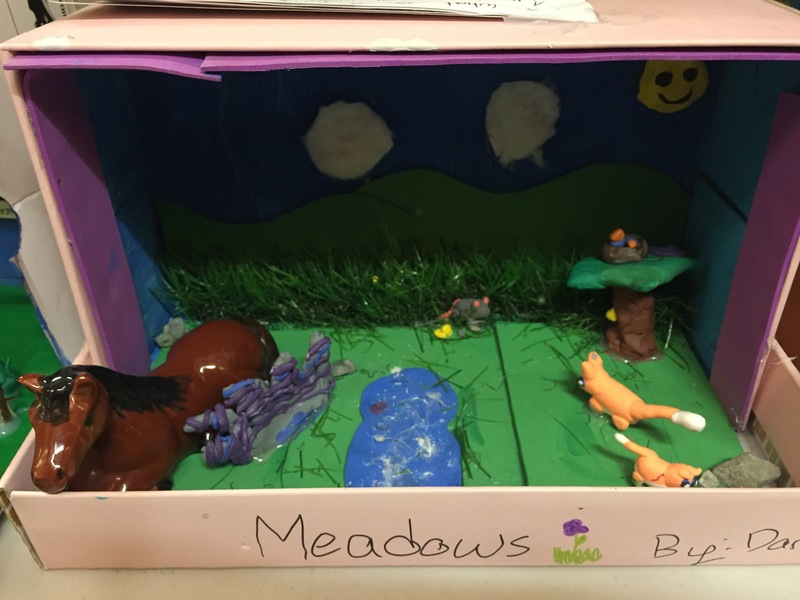 I had the opportunity to see this program in action in Mrs. Darby’s class and work with students in small groups. It was a pleasure to see students so actively engaged in their tasks. Next week is a short week for students. We have a Remembrance Day assembly on Tuesday at 10:45 and we would like to extend an invitation for our parent community to attend. There is no school for students for the rest of the week. Wednesday is Remembrance Day, Thursday is Curriculum Exploration Day and Friday is Pro-D.
Our Curriculum exploration day is an opportunity for teachers to spend a day learning about our new Provincial curriculum. Teachers will be busy both here at our school and at sites around the district for learning. Our Pro-D day on Friday will be spent with our teachers learning about a student self regulation program called Zones of Regulation. The Zones is a systematic, cognitive behaviour approach used to teach self-regulation by categorizing all the different ways we feel and states of alertness we experience into four concrete zones. The Zones curriculum provides strategies to teach students to become more aware of, and independent in controlling their emotions and impulses, managing their sensory needs, and improving their ability to problem solve conflicts. Friday also includes a field trip for some of our teachers to the Aboriginal Library at our District Education Centre to see what aboriginal resources are available to us as the new curriculum imbeds learning about our First Nations culture into all curricular areas.